Did you know that magnesium is the fourth most abundant element on Earth after iron, oxygen and silicon – it comprises 13% of its total mass. It has an equally important role in the human body - magnesium ions are vital for all cells in it. The most important bio-poly-phosphate components - ATP (adenosine tri-phosphate), DNA and RNA are carried out due to them. More than 300 enzymes need magnesium ions for their proper function. It is medically proven that if taken excessively, magnesium causes laxative effect and its taste is predominantly sour. Magnesium plays a very important role in the diet of every person. There are many cases of proven deficiency of magnesium that has caused asthma, diabetes and osteoporosis. In one average person, there are about 24 g of magnesium - 60% in skeletal structure and 40% in the cells. Alcohol is one of the factors that substantially reduce the level of magnesium in the human body. The risk of overserving with magnesium is very small as it is filtered by the kidneys without stressing them. Such risk exists only for people with problematic urination. Magnesium is an essential element in sports. It supports the absorption of calcium, which is a key element for the proper contraction of skeletal muscles. It is also intracellularly connected with potassium. Alone or in combination, magnesium prevents muscle cramps or cramps that are extremely unpleasant for athletes. Its combination with vitamin B6 is a classic. Vitamin B6 improves protein synthesis. 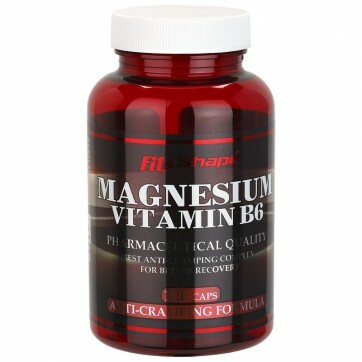 While magnesium helps muscles relax after a tough workout, B6 ensures rapid synthesis of proteins from food, which enter the muscles through the bloodstream and recover them faster. DIRECTIONS OF USE: Recovers tired muscles after exercise or intense physical activity. Enhances protein synthesis and prevents muscle cramps. For best results, take 1-3 capsules immediately after exercise and /or 1 capsule in the evening before bedtime. On non-workout days, take 1-3 capsules daily 15-20 mi. before meals. INGREDIENTS: Magnesium (magnesium citrate), Vitamin B6 (pyridoxine), hard gelatin capsule.